Crews have hit some significant milestones over the last month on the I-5 South County Improvements Project, a $230 million effort that extends the carpool lane from San Juan Capistrano to San Clemente and reconstructs the Avenida Pico interchange. The new deck on the recently constructed bridge over Avenida Pico has been poured, and crews have lowered the temporary structure supporting the concrete bridge as the concrete cured. The temporary structure, known as falsework, will be moved to the east side of the interchange once work starts there. The deck required 603 cubic yards of concrete, enough to completely cover a football field with about four inches of concrete. The nine-hour pour took 61 trucks that delivered 1,182 tons of concrete. Traffic lanes are tentatively scheduled to be switched over to the new bridge in September, after which crews will demolish the remainder of the old bridge. Then work will begin on the second half of the Pico bridge, starting with pile driving for the foundation. Meanwhile, motorists are seeing sound walls go up on the southbound side of I-5 between Avenida Vista Hermosa and Camino de Estrella. Drivers exiting at Avenida Vista Hermosa will notice new configurations on some ramps as crews shift traffic to move forward with the next stage of construction. That stage will include a series of long-term ramp closures coming this summer at Avenida Vista Hermosa and Camino de Estrella. The full closures – ranging from 55 hours to nine days – will allow crews to work more efficiently to realign the ramps. The first one, a nine-day closure of the loop on-ramp from Avenida Vista Hermosa to southbound I-5, is tentatively scheduled to begin July 18. A little further north, crews are pouring the face of the retaining wall along southbound I-5, just past the PCH/Beach Cities exit. 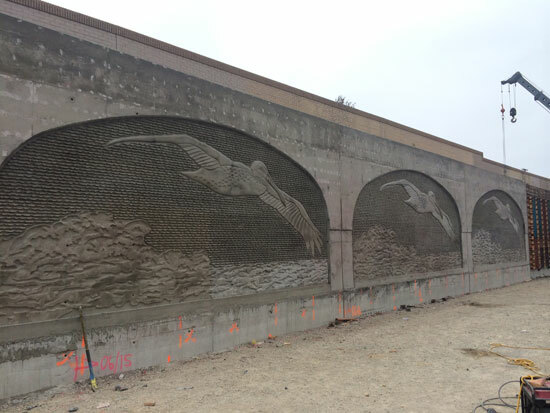 The wall face is constructed using specially crafted form liners that, once removed, will reveal an architectural treatment displaying pelicans and waves. In all, it’s about 21 weeks of work. For more information about the project and to sign up for weekly construction alerts, visit the I-5 South Improvements Project webpage. Send questions to southoc5info@octa.net.